What a fun post to read and thanks for the new sites to put on my list for next time I’m in Ireland! I suppose you’ve also heard of “Hungry Grass.” Would you know about any locations for this phenomenon? I don’t know where you might see fairy grass “in action.” I did hear of someone building a house in Leitrim across a fairy path and having all sorts of trouble, but I can’t remember if it was something my brother told me about or something I read. Also, that Andrew McCarthy video reminds me of my search for Biddy Early’s cottage ruin in Feakle, Co. Clare – all the stops for directions (which included being told we’ll pass a stream that we eventually found out was invisible from the road and a once white house that had just been painted a day or two earlier in a color they couldn’t recall), being told “you can’t miss it,” the amused looks from the people we asked direction of, and finally like McCarthy, finding it! I’ve had an afternoon’s fun on that magic road in Waterford some years ago. I just got back from doing the Magic Road. This blog helped out a bit, but I would like to add a few more details about getting there. It’s not actually in the city of Waterford. It’s in Dungarvan, about 50 minutes away. People in Waterford most likely won’t know what you’re talking about if you ask them about the Magic Road… but everyone in Dungarvan will. 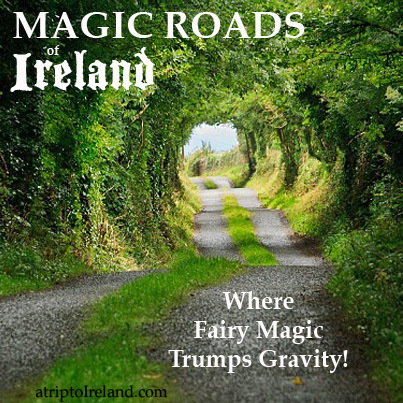 Once you get to Dungarvan (there is a Bus Eirann route from Waterford to Dungarvan), ask a taxi driver (or, if you’re in own car, as for directions) to take you to the Magic Road. It is a bit out of the way, but not much though. And it’s absolutely BEAUTIFUL up there…. the best countryside I have ever seen! The road itself is great fun — we were going faster — UPHILL! — than I had expected. Even our cab driver, a lifelong resident of Dungarvan (but who had never been to the Magic Road himself) was impressed! If you’re into this quirky, off the beaten path kind of stuff, it’s totally worth it! We ended up paying 50 euro as agreed upon by our cab driver… that sounded reasonable, especially since he drove us a little out of the way to take more pictures. Good point, I’ll add Dungarvan to the instructions since visitors may not realize the difference between Waterford and Co. Waterford. Glad to hear you had a fun experience on the magic road. Never thought of getting a taxi, but why not. Cheaper than hiring a car anyway. The so called more rational-sounding explanation is false.I was there many times,and horizon line is visible,you can even note sea shore far away.And I drove around 3 km without using engine,so optical illusions seems to be false assumption.I mean the magic road in Comeraghs Mts.